There are two contaminants commonly found in water that have been in the spotlight for the past decade. These are arsenic and fluoride. Most groundwater sources will contain two to three ppb of arsenic and generally a trace of fluoride. These are both well below the current US EPA maximum contamination levels (MCL) of 10 ppb and 4 ppm, respectively. So why the big fuss? When the US EPA determined that the old arsenic standard of 50 ppb was not sufficiently protective, the standard was reduced to 10 ppb, in 2006. This left many municipalities in a bit of a pinch because they were geared to deliver city water somewhere between 11 and 49 ppb, which was above the new and below the old standard. Now they would have to install expensive treatment to meet the new Inlet levels. Many municipal suppliers were very small and under-funded so they slipped through the exemption cracks. Compliance dates got drawn out for several years. Many new well owners were not even aware that they were out of compliance. Today, most water supplies, including private wells, have treatment in place to provide ‘safe’ levels of arsenic (below 10 ppb); although the only safe level is zero(1). It has been well documented that arsenic is highly toxic and ingesting arsenic (even well below the safe limits) can be dangerous because it is bio-accumulative and builds up in the body. One study showed that children exposed to levels below the 10-ppb limit suffered from lower IQ scores.2 Although the primary source of arsenic in the daily diet is from food sources, the bottom line is that arsenic, at any level, is not a good thing to leave in your drinking water. Fluoride is classified as a regulated contaminant by the US EPA and is listed as an “unapproved new drug” by the US Food and Drug Administration (US FDA). The type of fluoride salt used in municipal water treatment is a hazardous waste product generated by the aluminum and phosphate fertilizer industries. 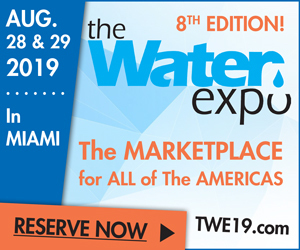 As of 2002, about 66 percent (162 million people) receive fluoridated water (at 0.7 to 1.2 ppm) from their municipal supply and the goal is to increase the acceptance to at least 75 percent. The benefits of ingesting fluoride are controversial at best since there has never been a bona fide study showing any benefit other than via topical application. Fluorosis, a skeletal disease caused by excess fluoride in the diet, is on the rise even in areas that do not supply fluoridated water. Fluoride is also contained in food. This led the American Dental Association to report that the current fluoride levels in water are damaging children’s teeth.3 One study in China showed that ingesting higher than allowable levels of fluoride was responsible for lowering the IQs in children by up to seven points (4). Fluoridated water is a form of compulsory mass medication and will long be a topic of great debate. Some people object to it because they feel it does no good and others because it may do harm. Some object simply because they have no say in the matter. It should be obvious to users of the public water supply that the responsibility for providing safe drinking water resides with the user and not the provider. You do have a choice in the matter and the choice should be to remove unwanted contaminants for your own safety. Both arsenic and fluoride can be reduced by 80 percent or more through the use of a basic, under-the-sink POU reverse osmosis drinking water system. For those who wish to use the whole-house POE approach, the typical method is through adsorption media. Iron-based granular and/or resinous media has been shown to provide very high reduction rates for arsenic and generally provide a year or more of useful life. Fluoride can be removed by activated alumina (AA) that has been properly preconditioned, or bone char. Although both media are highly selective for arsenic and fluoride, they are not exclusive and do pick up other components in the water. Depending on the nature and levels of these other components, the life of the media can be seriously and negatively impacted. What are these other components? An article appearing in the March 2008 issue of Water Conditioning & Purification International(5) gives a good graphic illustration of the impact of pH, contact time, phosphate levels, silica levels, vanadium, content and other oxyanions (Se, Mo, U, Sb) on the throughput capacity. The biggest impact on capacity is the pH of the feedwater. 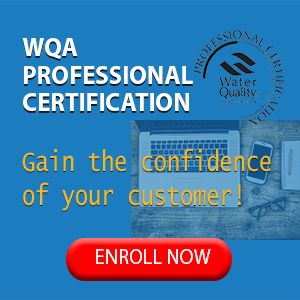 Over the range of potable water (pH of 6.5 to 8.5), the capacity is reduced by approximately 50 percent as pH increases. On well water with a pH of 9 or higher, the loss can exceed 80 percent. And size matters. Running a system at six to eight gpm/cu ft will produce only about half the capacity of a system designed to run at three to four gpm/cu ft. Silica in the water has a major impact at high pH but a lesser one at neutral. At a pH of 8.5, a 40-ppm silica level in the feedwater will show only 30 percent of the capacity it would at a neutral pH of 7. Other oxyanions such as those of phosphorous, vanadium, selenium, molybdenum and uranium also vie for space on the adsorbent. The impact varies but it can decrease the capacity by 50 percent over the range of non-detect to normal background levels. Most city water will have undergone an oxidation treatment with chlorine or chloramine prior to delivery. This pretty much guarantees that the arsenic present will be pentavalent As+5 (arsenate). This form is more readily removed by treatment or RO. Well water may contain As+3 (arsenite), which is far more difficult to remove. Iron-based adsorbents will remove the trivalent specie but at the price of capacity. If 20 percent of the arsenic is present as As+3 in a pH 7 water, the capacity of the media is reduced by 70 percent. If the pH is 8.5, the reduction is almost 90 percent. The rated capacity for iron-adsorption media is about 75,000 bed volumes (BV) or 500,000 gallons per cubic foot with low interference. This means that a single cubic foot of media might treat a typical residence for four years. The reaction mechanism for fluoride adsorption on AA is that an insoluble aluminum fluoride (AlF3) is formed. Alumina also reacts with other components of the raw water, such as alkalinity and other metals, which will reduce the throughput capacity. In addition, AA is flow sensitive. These effects were graphically illustrated in an earlier article.6 At a design flow of two gpm/cu ft, the throughput will decrease by about 25 percent at three gpm/cu ft and nearly 50 percent at four to five gpm/cu ft. Recommended design is at two to three gpm/cu ft.
Alkalinity, the presence of bicarbonate (HCO3-), has the biggest negative impact on fluoride removal. Alumina is tolerant up to about 20 ppm of alkalinity but capacity drops by about 30 percent at 50 ppm and 50 percent at 100 ppm. Typically, water may contain as much as 200 ppm of bicarbonate with a corresponding capacity loss of 75 percent on fluoride adsorption. The typical loading of fluoride onto alumina is about 1.6 percent by weight. With a cubic foot of alumina, clocking in at about 40 pounds (18,200 grams), that calculates to 290 grams of fluoride or 290,000 mg. That’s the equivalent of 290,000 liters (77,000 gallons) of treatment at one ppm of fluoride per cubic foot. To treat a whole house for a year would require about 1.5 cu ft of media. Conclusion: What have we learned so far? Both arsenic and fluoride media are negatively impacted by high pH, flowrate and interfering ions. This suggests that some form of pretreatment to lower the pH and remove the interference would improve the performance and life of these media. There is a great way to do just that. Strong-base anion resin (SBA), commonly used for de-alkalization, can do all of the above. These salt-regenerated ion exchangers will remove alkalinity (replacing it with chloride) and reduce the pH of the feed down into the pH 6-7 range. At the same time, oxy-metals and phosphate are removed as is a substantial portion of the arsenic and fluoride. If we then use the proper adsorbent as a polisher, the life and capacity is increased by a factor of eight to 10 times. Select an NSF- listed SBA to ensure it is free of taste and odor. 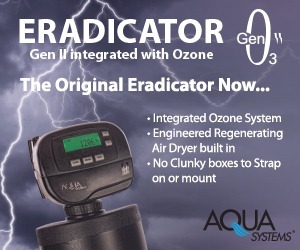 Size it at two to three gpm/cu ft and regenerate it on pH break (exhaustion on alkalinity), which is typically around seven to 8,000 grains/cu ft based on alkalinity alone. This means a water with 120 ppm alkalinity (7.0 gpg) will produce about 1,000 gallons per cubic foot between regenerations, which can be done at six to eight lbs NaCl per cu ft. SBA resin in the chloride form (salt regenerated) will not reduce silica. It will, however, reduce the pH, resulting in very low interference from the silica. Size the polisher correctly to maximize the capacity. Figure 1 shows a schematic of the flow. 1. 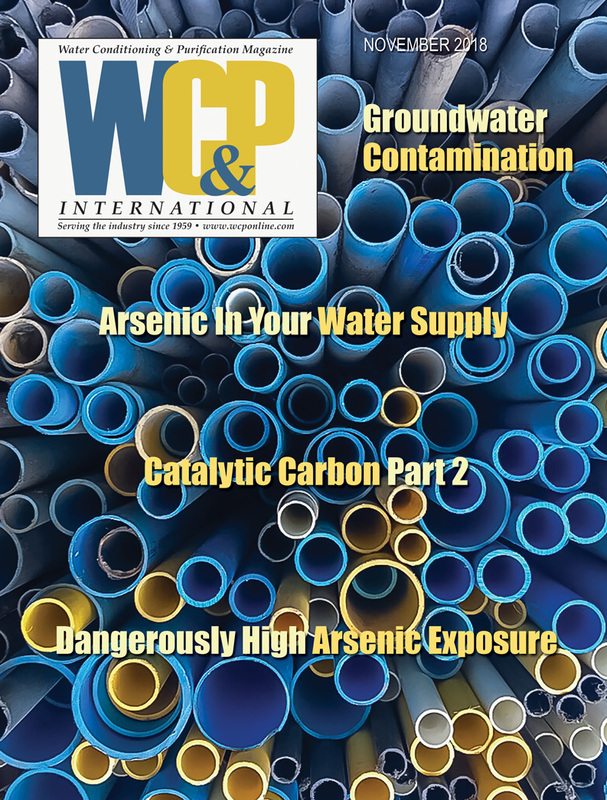 Michaud, C.F., “Bringing Arsenic Down to Safe Levels in Your Water,” WC&P International, December 2014. 2. US School Children Exposed to Arsenic in Well Water Have Lower IQ Scores, Columbia University Mailman School of Public Health, July 2014. www. mailman.columbia.edu/print/5452. 3. Journal of the American Dental Association, Vol 44, Number 2, February 2002. 4. Choi, Anna, et al. “Developmental Fluoride Neurotoxicity”, Environmental Health Perspectives, October 2012. 5. Michaud, C.F. “Factors Affecting the Capacity of Arsenic Removal Media,” WC&P International, March 2002. 6. Michaud, C.F., “Fluoridation, the Good, the Bad and the Ugly, Part 2,” WC&P International, March 2010.